I don’t always head to the craft store with specific things in mind…but sometimes things jump out at me, and what can I do? I have to catch ’em. 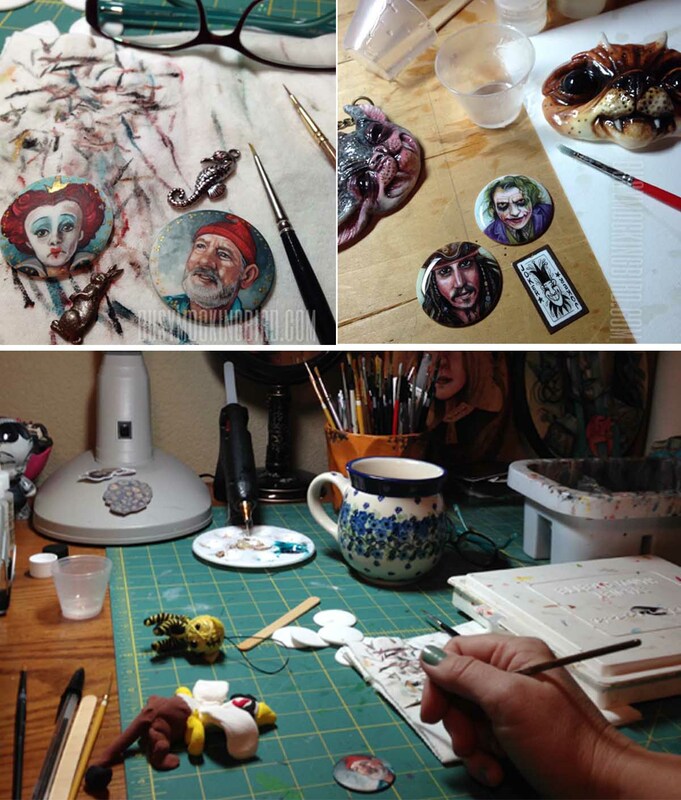 Recently, I was inspired by these tiny cameos by Mab Graves and on my next visit to the craft store, I wandered into the jewelry section–which is fairly unfamiliar territory for me–looking for something that I could maybe draw on or paint on or….oh I dunno. I was just looking. And then these little porcelain blanks jumped out at me, and landed right into my shopping basket. Along with them, some little necklace chains (which is what I had REALLY gone there for in the first place), and wouldn’t it be cool if they each had a charm?? And you’d HAVE to seal them in jewelry resin, right? And before I knew it, my little basket was full of tiny pieces of things. Because I’m a skimpy spender, I instantly started to second-guess myself on the ride home. Was I really going to try to paint miniatures??? I have already been a fan of Lorraine Loots’ 365 Postcards for Ants, and I knew I was nowhere near THAT skill level. Did I just jump into yet another hobby that I’ll consume voraciously, and then eventually lose the drive for later down the road? But I pushed those thoughts aside and gave it a try anyway, because that’s how I roll. And OH my GOSH how much FUN they are! 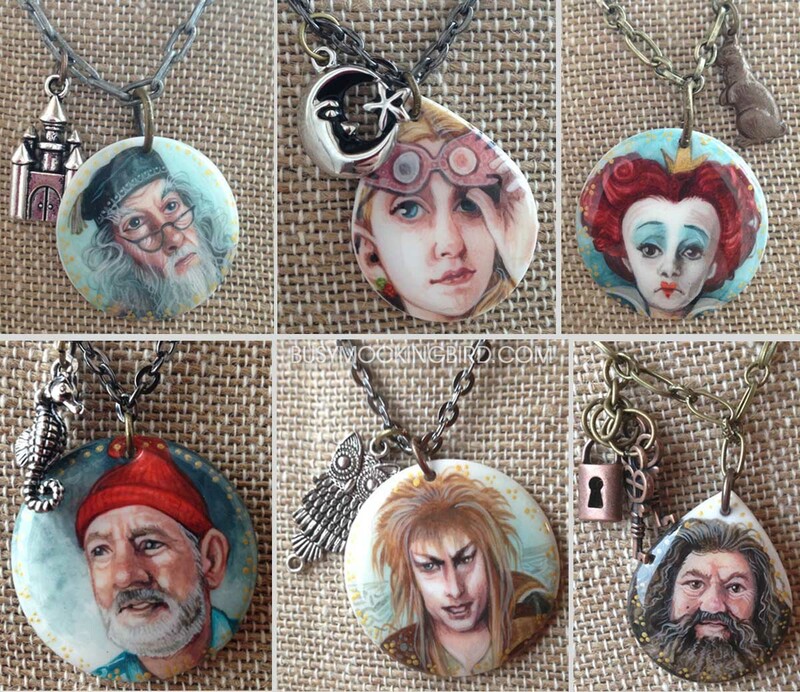 I am really having a good time finding little pendants that correspond to the portraits. And although painting tiny is a little challenging, I really have a lot of fun trying to capture an expression and a likeness in an inch-and-a-quarter diameter. I’ve tried a magnifier lamp, but honestly, since I’m naturally nearsighted, it’s easier just to take off my glasses and get in really close. The most important thing is light. My mom gave me an Ott desk light, and I got another smaller one to pull out just for this closer, detailed work. So I put them up on my Etsy shop, and I’m having fun with them for now. I’ve got tons of ideas for more, and the raw porcelain takes paint like butta, it’s so wonderful. And I think it’s okay if I’m super into them right now, and then maybe not so much later down the road. That’s how it goes, I guess. Can you share what brand the porcelain disks are so I can look for them? Do they need to be kiln fired? Sure thing! The brand is Blank Slate, and I think it’s a Hobby Lobby brand (they’re the closest craft store in my area). I haven’t been able to find them in bulk, so I ordered directly from their website. These don’t require any firing, but I seal them in jewelry resin for protection. Hope that helps! They’re all beautiful, but I love the Birds one! Wow. These are just gorgeous! PS I’m trying to buy a copy of your book for a gift but the shop is quoting 30 bucks for delivery to Australia. That makes it a little prohibitive for me. Anyway of being able to get a cheaper rate than that? Thank you so much! I’m sorry about the book–the printer does seem to have a higher rate than if I do it myself. If you’d like to send me an email via email (busymockingbird.com), I’ll see what I can do for shipping. Still, when I did kickstarter, I know some of the international shipping was around $20 sometimes! Thank you so much! 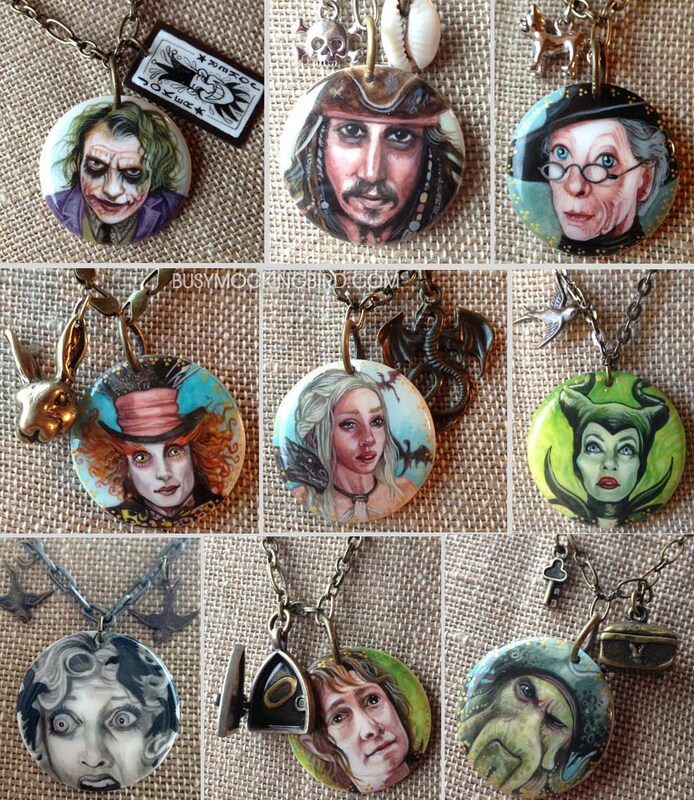 Okay, must have the Harry Potter ones. Wow these are really awesome! These are fantastic!! Good luck with them.